The Information Commons (G/F) and Learning Commons (LG1) are supportive learning spaces that provide a variety of computers, equipment, group study rooms and services. 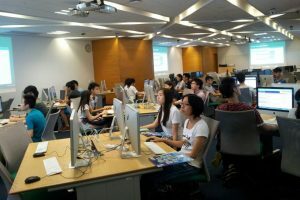 At the IC, you can find computer workstations for individual work as well as small-group discussion. Printing and scanning machines are close by. The 3D printing service is in the Modeling Space next to the IC Help Desk. 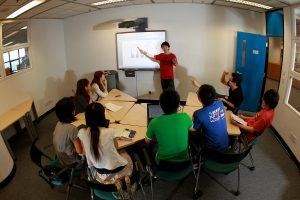 The IC Learning Space with an interactive projector is suitable for presentations or small classes. The LC opens 24-hours during Fall terms and Spring terms. It consists of different components. To book a study room, use the online booking system; to run a teaching session, set up tutorials, or other academic activities at the LC, check the teaching venues option or talk with us directly. The space for taking a break from studying – have a light snack and refreshment, watch TV, or just hang around. The Creative Media Zone supports graphics and media production for learning and teaching. 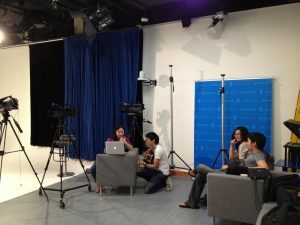 It consists of the Media Production Studio (with a control room and a dressing room), 4 AV Editing Suites, and the Graphics Workshop. The facilities and services are operated by Publishing Technology Center, which has a service counter inside the Graphics Workshop. Check the website or visit the counter for service details.